“Rick Cassata” Greater Buffalo Sports Hall of Fame. Outstanding high school athletes frequent possess the tools of stardom in more than one sport, and indeed the Greater Buffalo Sports Hall of Fame features more than a few multi-sport notables. Even among that crowd, however, certain athletes stand out, including a player widely considered the best three-sport athlete ever produced locally on the high school level -- Rick Cassata. A product of Buffalo's West Side, Cassata first served notice of future greatness at Tonawanda High School. 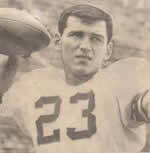 A strong-armed quarterback, Rick attained All-Niagara Frontier League honors as a junior in 1962, and added All-Western New York and All- American citations in 1963. Rick paced the Red Warriors to a share of the NFL title in 1962, and to an undefeated championship season in 1963. Basketball and baseball provided additional showcases for Cassata's talents. Rick led his roundball teammates to an AAA Sectional championship in 1962, and a year later achieved All-NFL status as a forward. Rick's basketball contributions were recognized with selection to the NFL All-Decade team for the 1960s. Rick was no less a terror on the diamond; the hard-hitting, hard–throwing shortstop/pitcher won an NFL batting title in 1963 and All-NFL and All-Western New York honors in 1964. During senior year at Tonawanda, football scouts from Miami University and Notre Dame beckoned (he was the No. 1 prospect for the Irish, even more highly coveted than eventual Heismann winner Terry Hanratty), but Rick stayed close to home by choosing Syracuse University. With Cassata and Csonka in the backfield, the mid-1960s was a golden gridiron era for the Orangemen, and Bowl appearances capped off each of Rick's last two seasons in college. Although the 1966 Gator Bowl featured a fine performance from Cassata, he saved his best for last. In a memorable 1967 clash in the Hula Bowl before a nationwide audience, he soundly outplayed his counterpart, UCLA quarterback and Heismann winner Gary Beban, and captured the game's MVP award. Rick also captained the Syracuse nine senior year, and faced another fork in the road after graduation, as scouts from the New York Yankees and Washington Senators crowded pro football scouts on his doorstep. Rick opted for the Canadian Football League. 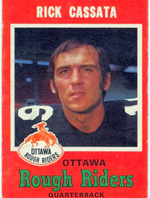 Cassata flourished as a quarterback in the wide-open CFL, and his stellar nine-year career north of the border included a Grey Cup win with the Ottawa Roughriders in 1973. Cassata is proud of his Western New York roots, which he still maintains, and the Greater Buffalo Sports Hall of Fame is equally proud to call him a member.